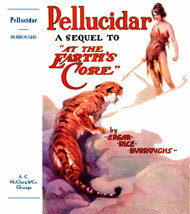 These are the dust jackets for the Edgar Rice Burroughs Pellucidar series. A.C. McClurg & Company published the first two in 1922 and 1923 but the series didn't really take off. Metropolitan published two books in 1929 and 1930, one a crossover with Tarzan, but the last three books were not seen until 1937, 1944 and 1964. Find those on the ERB, Inc. page when they're ready. Cover art by J. Allen St. John except where noted. 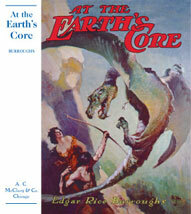 At the Earth's Core: 1922. 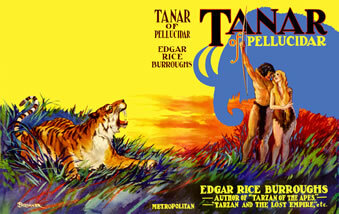 Tanar of Pellucidar: 1929. Cover by Paul F. Berdanier. 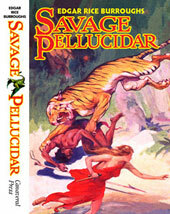 Savage Pellucidar: 1964. This limited edition 4-color alternate jacket for the 1964 Canaveral first edition is now OUT OF PRINT READ MORE. 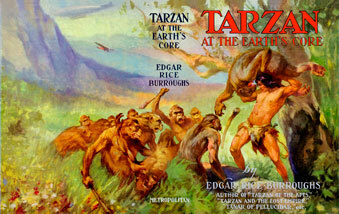 . .
Back to the Stone Age (1937) and Land of Terror (1944) were published by Edgar Rice Burroughs, Inc. with cover art and illustrations by John Coleman Burroughs. I'll be working on those jackets in the future.